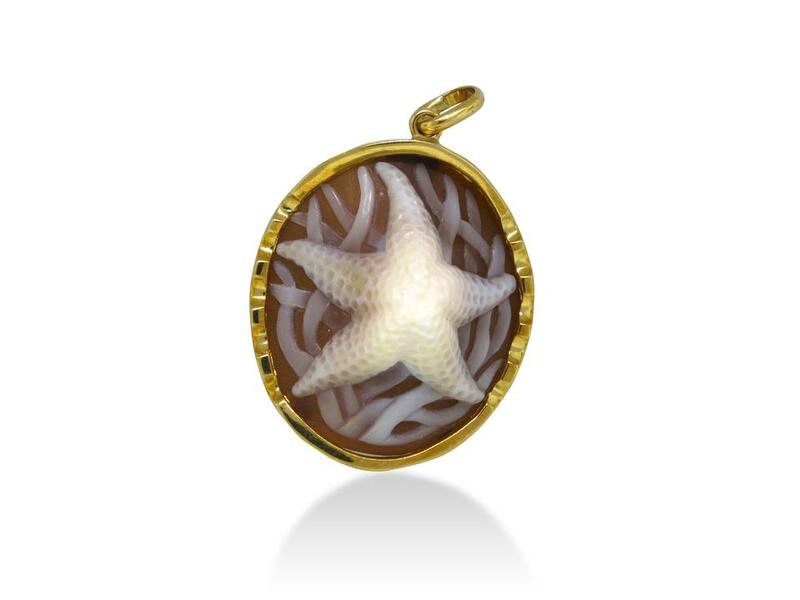 This cameo pendant has extraordinary high relief and fine detail that makes this starfish almost come to life. To achieve this effect, our master carver used a "high knuckle" portion of the shell, with some curvature on the reverse side, to produce this design. Starfish with sea grass cameo pendant, 28mm oval, set in 18kt gold. Registry number #862, Eco-Friendly, Fair Trade. Illustrated in Gems & Jewellery Magazine, Nov/Dec 2015, "Cameos of the Rainforest" by Helen Serras-Herman. A GemA publication.